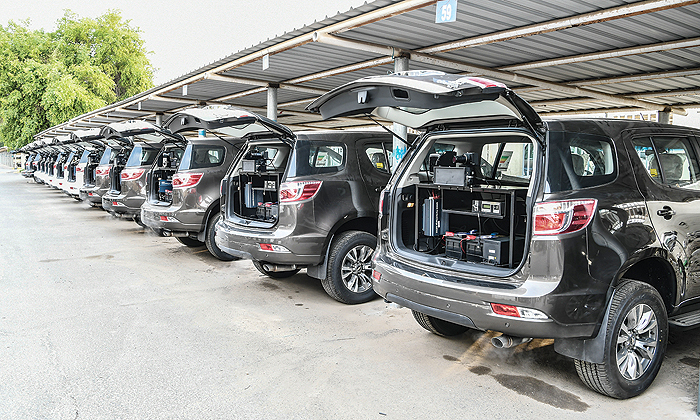 KUWAIT: Interior Ministry’s Assistant Undersecretary for Traffic and Operations Affairs Maj Gen Jamal Al-Sayegh yesterday launched 18 vehicles fitted with mobile speed cameras on main and side roads. He also launched a point-to-point (P2P) system along Abdaly Road to detect speed limit violations, which will become operational from Sunday, Jan 20. Operations Director at the Traffic Department Col Yousuf Al-Khaddah gave an explanation about the mobile speed camera vehicles and how they check the speed of vehicles while moving or remaining stationary, and how the license plate numbers are captured. He also explained the P2P system and how it checks and films all inbound and outbound vehicles.